It might be difficult to see at first, but therre are two S.O.B.s here. I had two brothers insist on having matching Bowies - to match the one their third brother had bought a year prior! 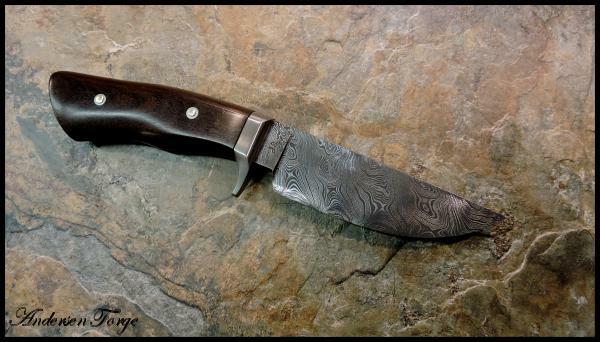 These were made using high-layer twist Damascus. 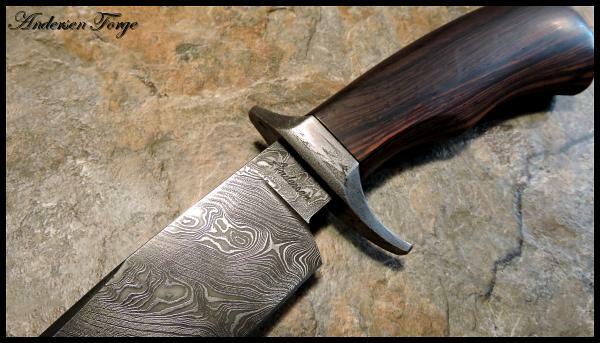 The guards were made from 1903 wrought iron and the handles were shaped from blocks of really, really nice Cocobolo, which is becoming difficult to acquire in this quality. All in all an enjoyable project. Don't forget to watch the movie!!!!!!! 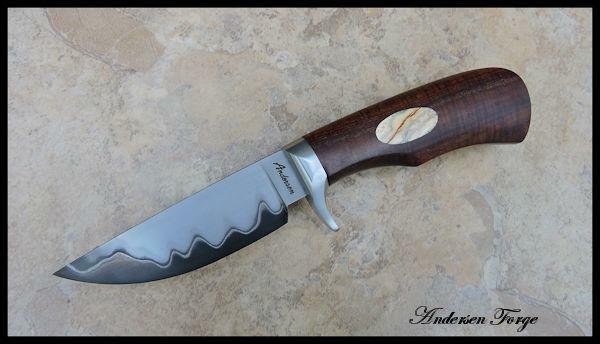 Here is the first of two hunter that really float my boat - Australian Ringed Gidgee Hunter with Mammoth Tooth inlay. Keep in mind this is NOT! Mammoth Tusk Ivory - this is the tooth. The colors that leach into the tooth from the surrounding minerals in the soil give the tooth its unique color stiations. 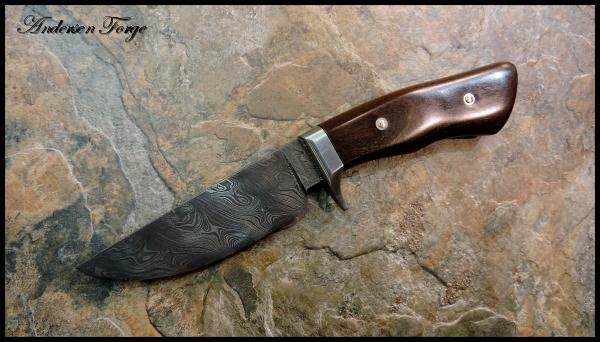 This is a really tight Twist Damascus blade that I hot-blued and left entirely black without sanding off the taller 15N20. 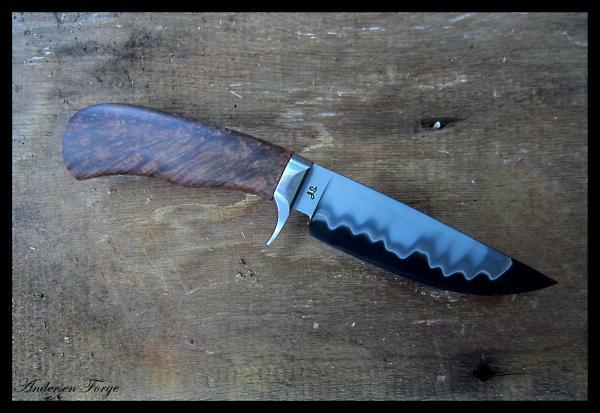 I also hot-blues the mild steel guard which gives the entire knife a rather manacing appearance. 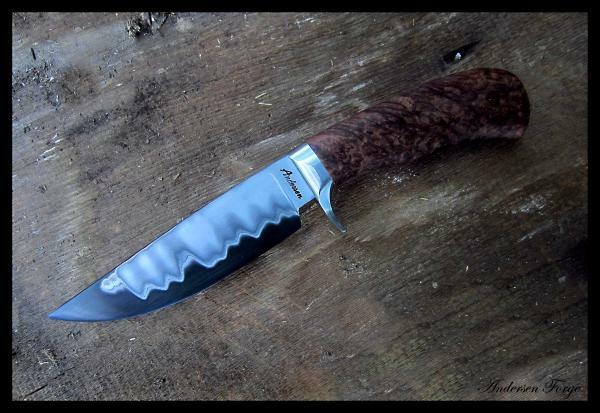 This was commissioned by a fellow from Sweden as a gift - for a girl moose hunter!!! 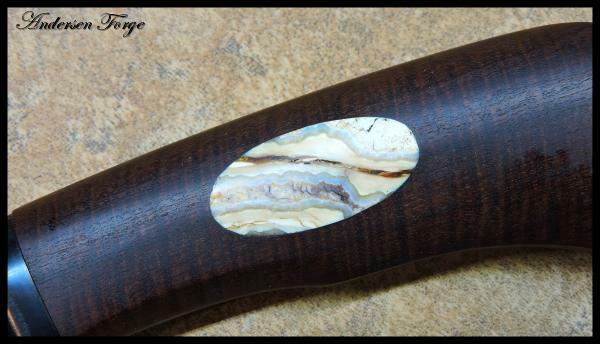 Here's another example of that same combination - Australian Ringed Gidgee with a Mammoth tooth inlay. 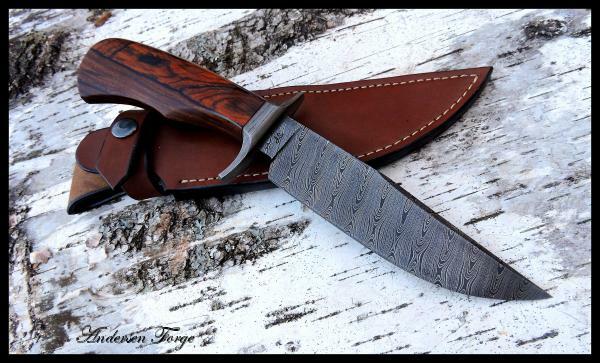 A little different blade material, being Stainless Steel over 1095 San-mai. 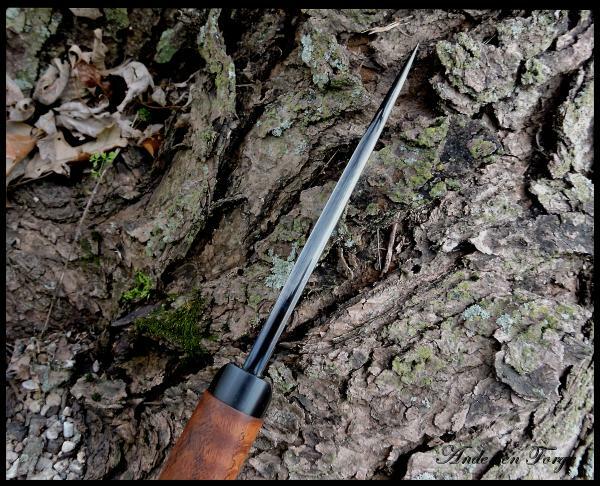 A 416 stainless steel guard accommodates the take-down assembly. 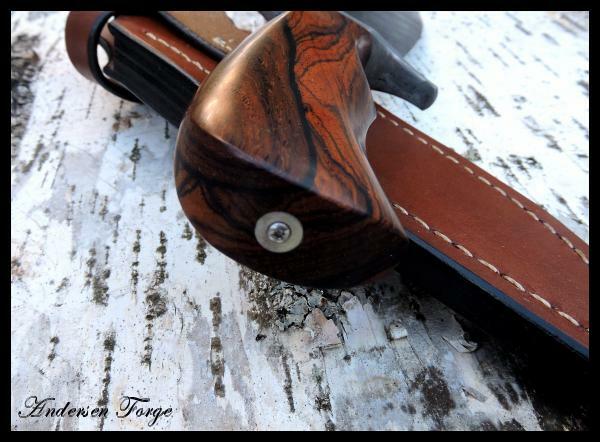 I love this combination of materials. A rather sweet little hunter here. 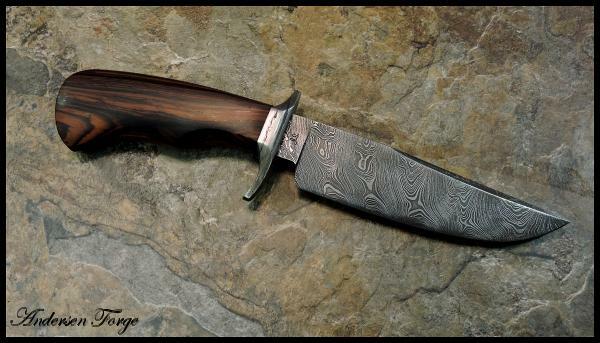 The blade is hot-blued single twist Damascus. 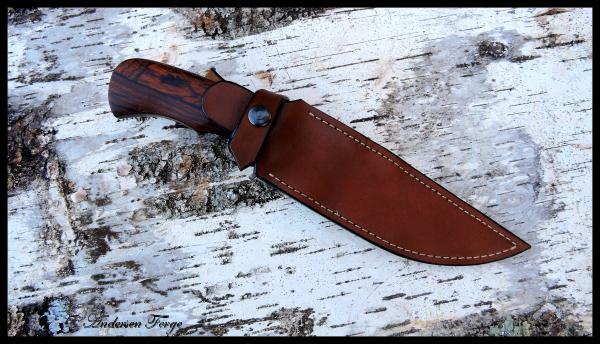 A little shorter than my normal hunter but just right for belt carry and to use in dressing game. 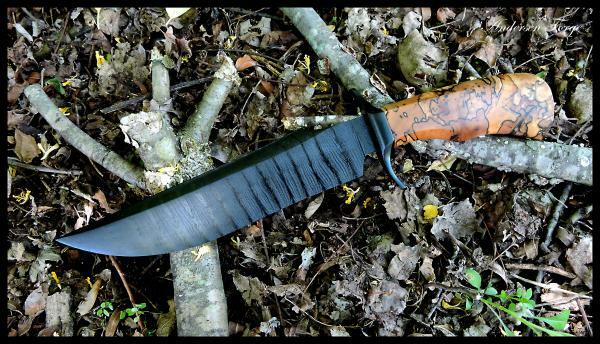 The guard is hot-blued mild steel. Something I don't get the chnace to use very often is stabilized Curly Oak!! 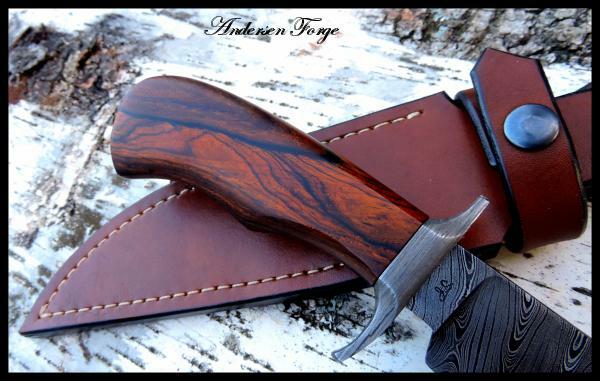 It's really distinctive and adds a nice "flavor" to a perfect belt knife. All built as a take-down. 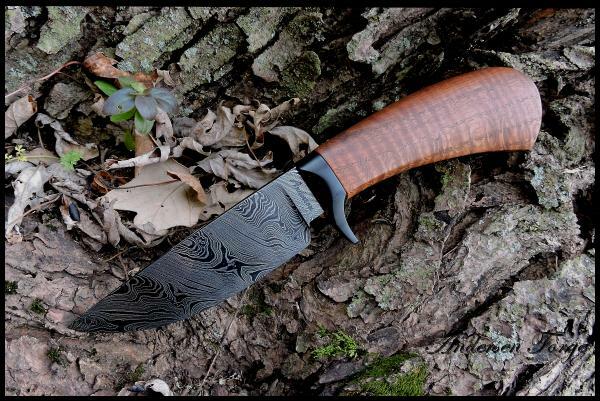 I just had to toss this in here to show the set of knives I made for the Atlanta Blade Show this year. I thought it made a nice shot. They are each individualy displayed in the rest of the page here. I thought this made a great match-up of materials. 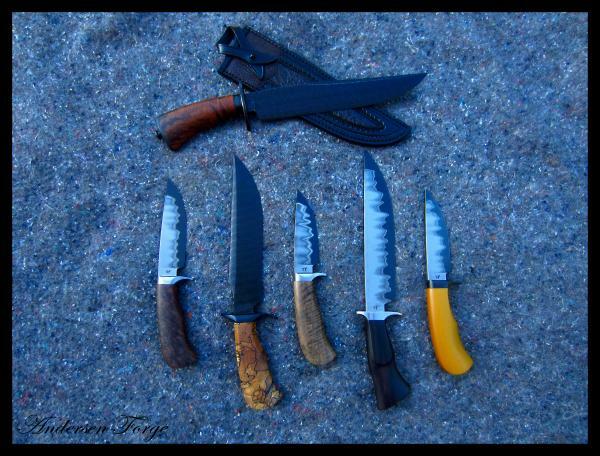 I do like contrast in the appearance of my knives. This is some rather old-growth stabilized Redwood Burl. I have a friend who acquired a nice supply of this from one of his customers and was able to do a little trade for some. 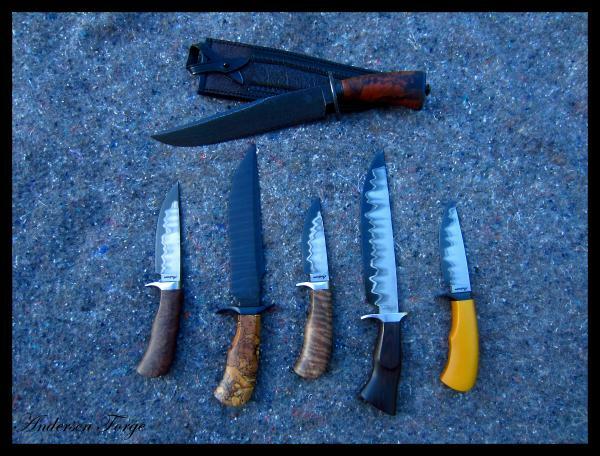 The guard is 416 stainless steel and the blade is 1095 and 410 stainless San-mai. 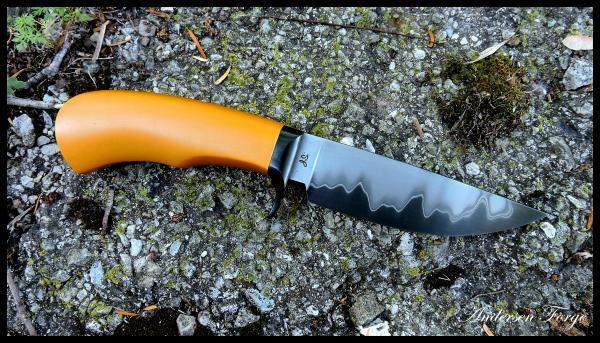 This is something we will continue to see less and less of from me in the future, and that is knives made with Bakelite handles. I was fortunate enough to acquire a rather healthy supply of Bakelite about a dozen years ago, but that supply has dwindled to the point of becoming rather "precious to me". I no longer offer it as a material choice to customers. 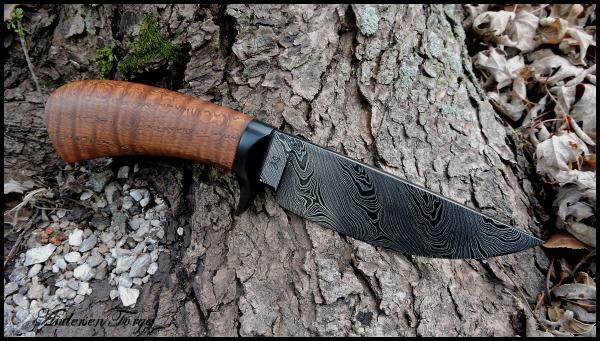 It will only be used on knives at my discretion for knife shows. 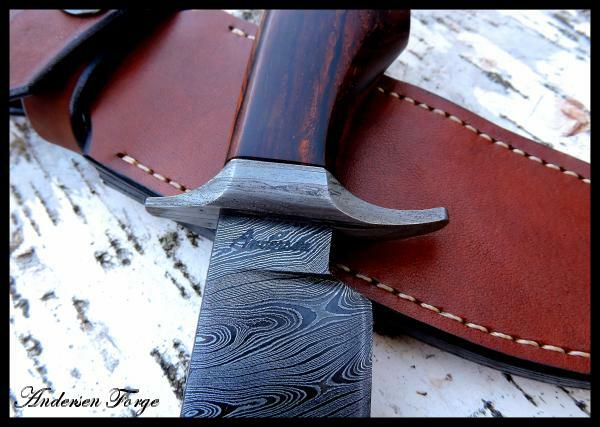 The blade was forged in San-mai style from 1095 tool steel for the core and 410 stainless steel for the jacket. 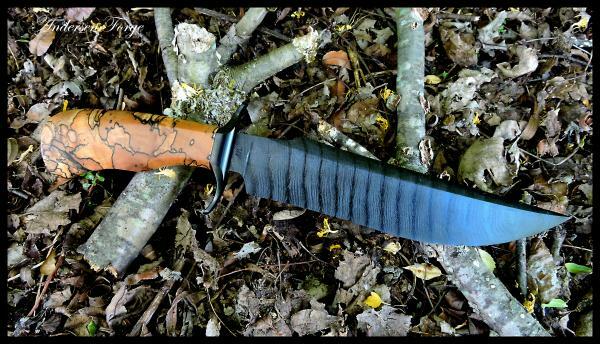 The steel guard is hot blued. The One That Bit Me. Yep - this one here bit me - and cost me 10 stitches!!! But, that's another story. After hot-buing the blade I decided to leave it entirely black as opposed to sanding off the bluing from the raised 15N20. 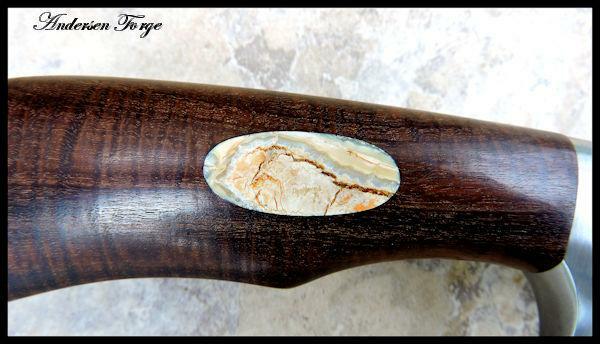 The handle is some striking end-grain spalted Maple. This all built in a take-down style. 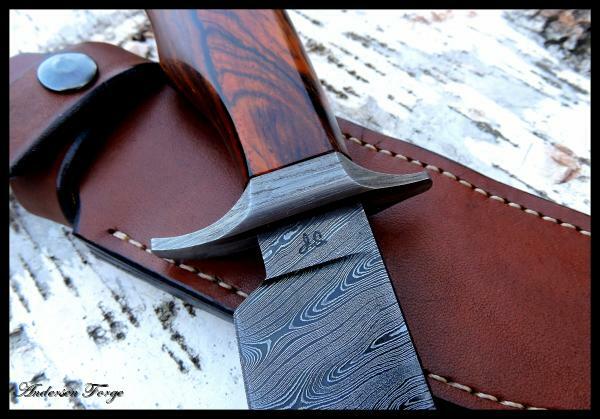 The sheath is from Paul 'Pappy' Long. 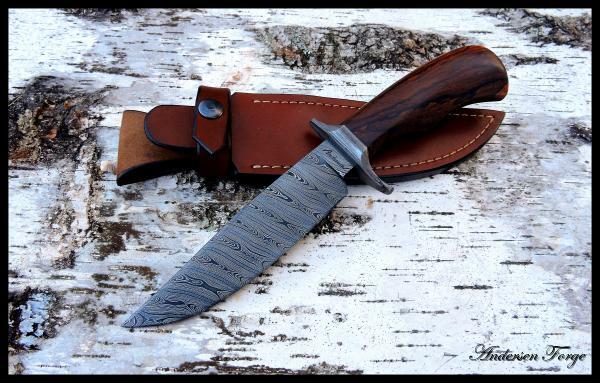 This knife was forged from a billet of my Single Twist Damascus. 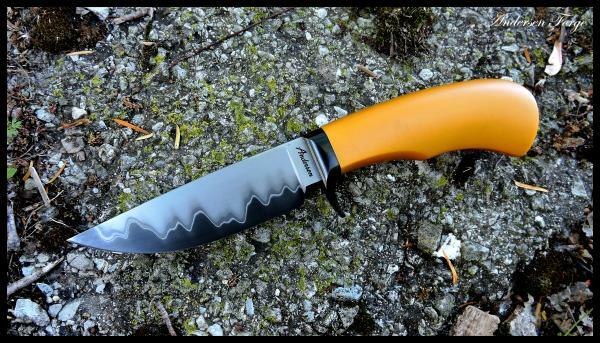 It is a 6 1/8" blade. 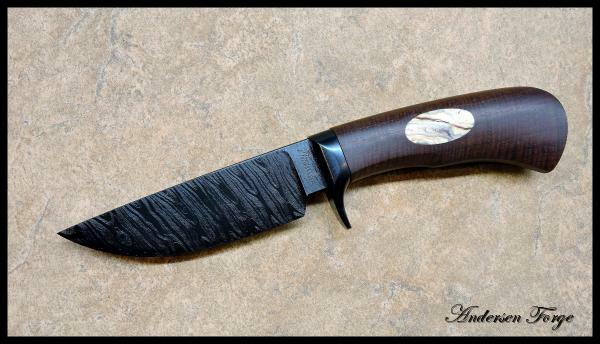 Occasionally, I just have to make a knife or two that does not follow my normal procedure the Take-down style. 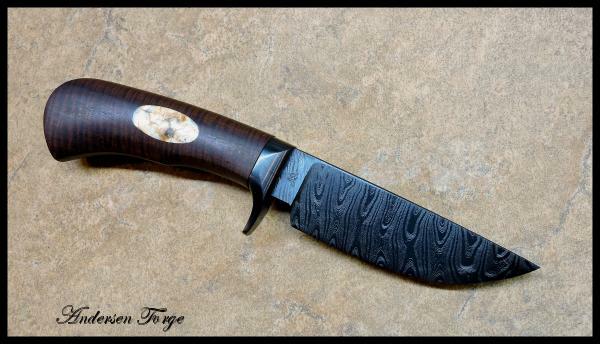 I named it the Santos Hunter after the handle material of Santos Rosewood. 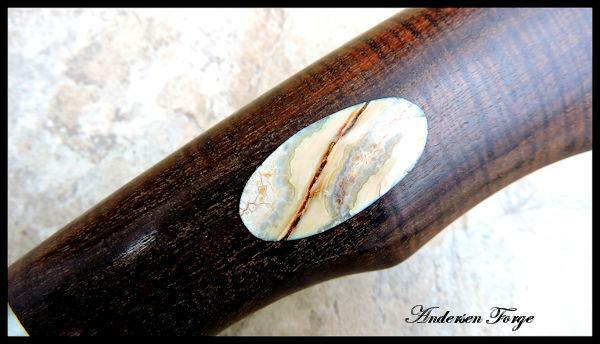 This was built in the style referred to as "mortised handle" construction. 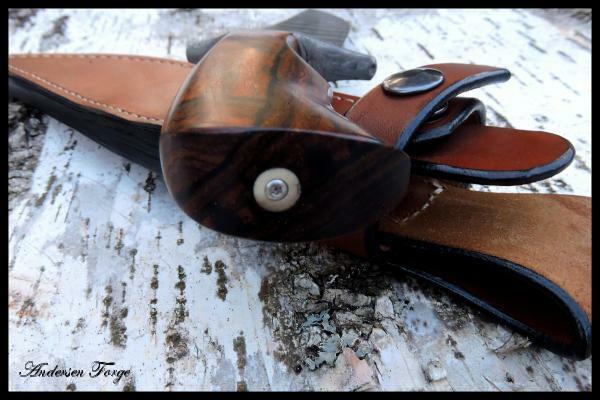 The handle is two pieces each of which has 1/2 of the tang milled into an internal slot. 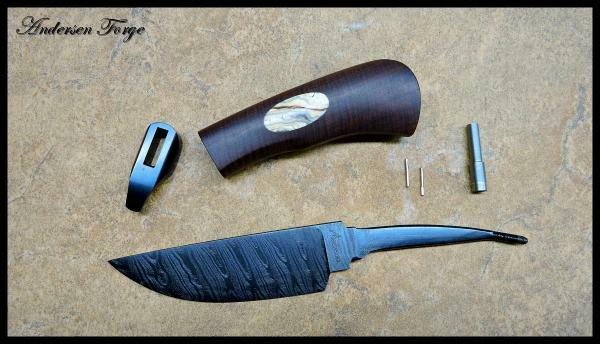 The handle is then pinned in place. 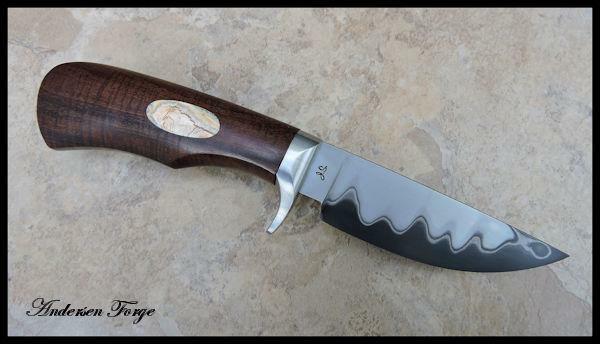 I use a method I designed a number of years back utilizing stainless wafers placed in the handle to prevent over-peening of the pins resulting in potential stress or splits in the handle. With these wafers in place, I can peen the pins literally as hard as I want. 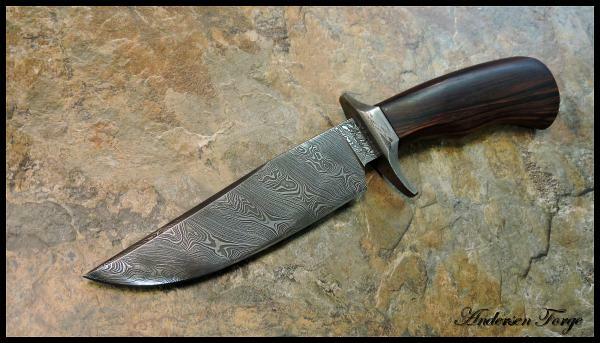 The guard is 416 stainless steel and the blade was forged from a billet of my Single Twist Damascus. She's now happily living in Atlanta.